Being cooped up inside all day can get lonely, especially for dogs with a lot of energy. That’s when dropping your dog off to play at daycare comes in handy. 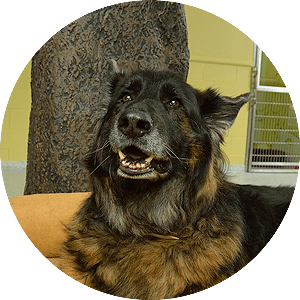 At Toureen Pet Resort and Spa, we offer supervised daycare from 7am to 6pm Monday through Friday, Saturday 7am to 5pm and Sunday 10am to 5pm. We have multiple play spaces, indoors and out. 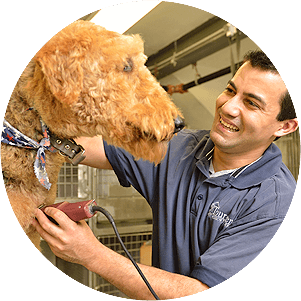 Dogs play inside on a non-porous, epoxy floor and outside on artificial turf to protect your pet’s health and safety. 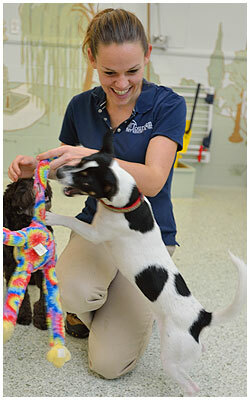 To help ensure a positive play experience, we group dogs in classes of 15 to 20 based on size, temperament and age. 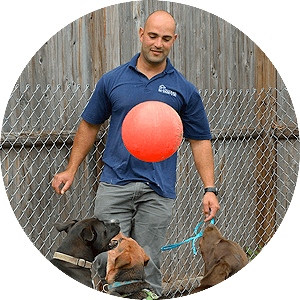 Our caring, fun-loving supervisors keep the socializing friendly and help dogs play safely on the furniture and with toys.